One of my favorite game brands is Ravensburger - I can always rely on their products being a high quality material that is fun and will last for years (I still have some of their games from when I was a kid). I recently received a generous game donation of On The Farm , a game that is geared towards the younger clientele, and is part of the company's "Imagine-Play-Discover" series. It turns out that despite the recommended age range of 2 & up the game is a great tool for speech & language therapy, so a review is in order! While the box states that this game is for 1-2 players, I have found this number to be arbitrary as this game can be easily adapted for therapy groups. The game is advertised to build skills in the areas of vocabulary, associations, deduction, as well as creative play. 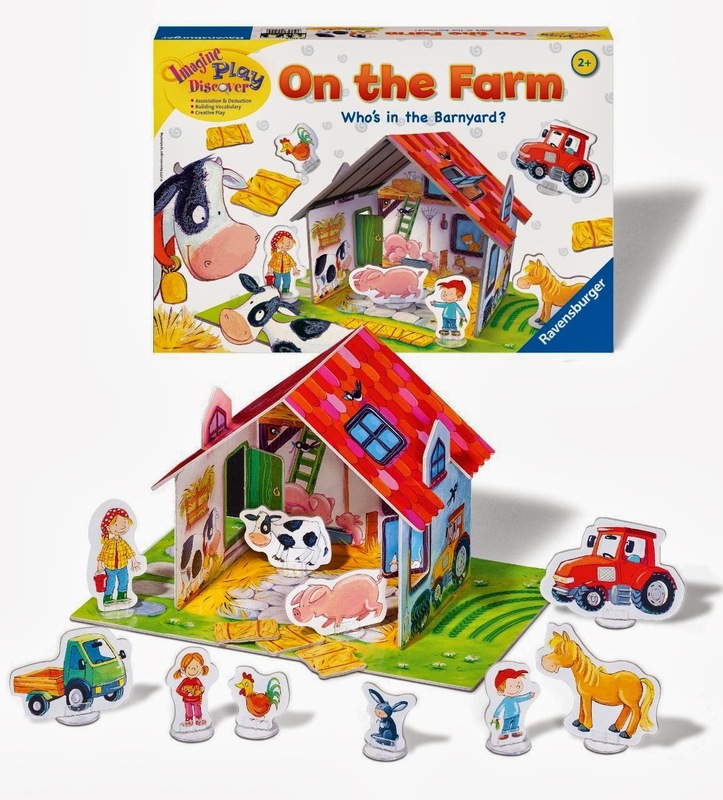 The game pieces are made of thick, sturdy cardboard for durability and consist of a base, barn, roof, and playing pieces that include a variety of farm animals, vehicles, and farm workers. Preparation: Players first need to construct the 3-D barn in order to get ready for play, which is easy for an adult, but takes some problem solving skills for a child (my language-delayed Kindergarten student needed to be clued into where the bottom of the barn could fit into the holes of the base). The barn is very colorful and contains illustrations of animals and other things you would find in a barn. You can spend some time talking about the objects and work on some deduction as well (e.g., Why do you think there is a ladder? What is the hay for? Why are there tire tracks in the grass? etc.). Even the windows and the door are part of the puzzle and can be removed/opened. Game Play: The instruction booklet provides a number of suggestions on how to adapt game play. 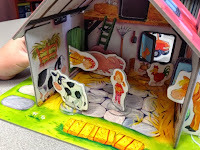 (1) For younger children, you can have the child complete the puzzle and ask basic questions about the farm and its components (e.g., "What animal is it? Where is the tractor parked? "etc.). You can then use the pieces to let the child engage in free play. This strategy would be great for working on basic Vocabulary / Animal noises. (2) For younger children, the adult can hold up a game piece and ask questions such as, "What is it? What noise does it make? Where does it belong?" and have the child subsequently places the figure with its counterpart in the barn. This is a great way to work on Matching. (3) For older children, you can place the game pieces in and around the barn. Then have the child close their eyes, and switch / take pieces away. They will then have to guess what has changed. This is great for working on Memory skills. Sequencing: You can work on very basic sequencing skills when setting up the barn. Ask questions like, "What do we need to build first? What comes next? Which part is last?" My students had a good time setting up the barn! Sequencing - after we put down the base, we build the walls. Last, we put on the roof! Mom is coming through the door! Following Directions / Positional Concepts: What makes this game a great tool for working on following directions with embedded positional concepts is that the barnhouse has a distinctive front and backside. In addition, the many details on the barn and game tokens allow for added complexity. Because the door and windows are removable, you can use the barn to work on some more advanced concepts, such as "through". Problem Solving: We worked on some basic problem solving too, by placing objects in "silly" locations, such as putting the tractor "on top" of the barn. This in turn allowed for some great questions - "How did the tractor get on the roof? Could this really happen? What would happen to the roof?" Sorting: Because the game pieces are from a variety of categories, you could have students work on sorting and have them group animals, persons, and vehicles. You could even increase the complexity of this task by instructing students to place all the people inside, the animals next to, and the vehicles behind the barn. Pretend Play: Last but not least, this game can be used for pretend play. And the best part is that unlike a dollhouse, it folds neatly back into a box at the end of the day. 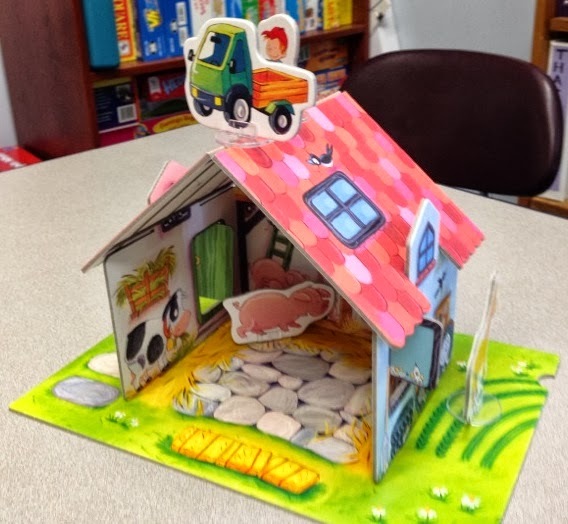 "On the Farm" would make an excellent game for preschool and early intervention speech therapists, but is also a valuable resource for those of us working with lower cognitive functioning students. Or, if you have young children of your own, you could get it as an early Christmas gift for them. As for me, I can never have enough hands-on materials to work on following directions with my students! This is definitely a great addition to my repertoire, and knowing that it's from Ravensburger, I know it will likely last me for a while. "On the Farm" is available on Amazon . Go check it out! Bannerizer made it easy for you to promote ClickBank products using banners, simply go to Bannerizer, and grab the banner codes for your chosen ClickBank products or use the Universal ClickBank Banner Rotator Tool to promote all of the ClickBank products.